I delayed installing Windows SP3 on my MacBook Pro BootCamp partition because of some sub-conscience fear. 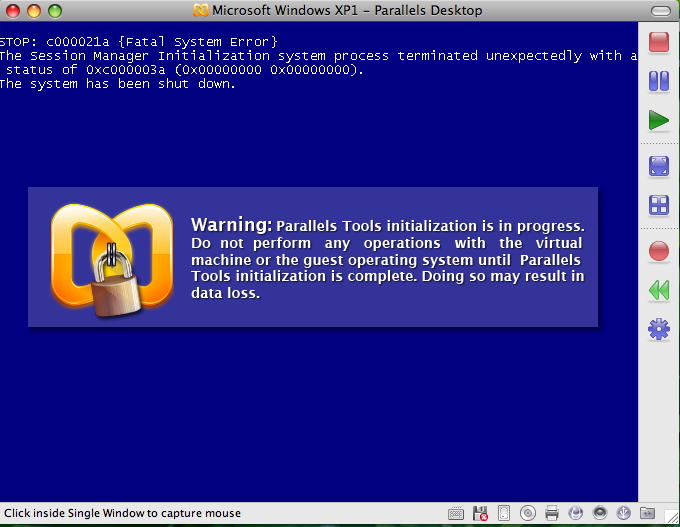 If you think it will happen, it very well could – Parallels couldn’t get the Windows Virtual Machine to boot. 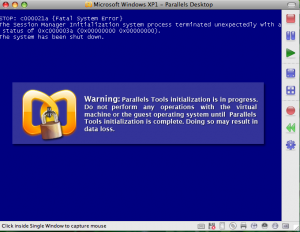 Select XP Boot Camp Virtual Machine but don’t start it. Click “Hard Disk 1″ and open Configuration Editor. Click “Advanced” on the right panel. 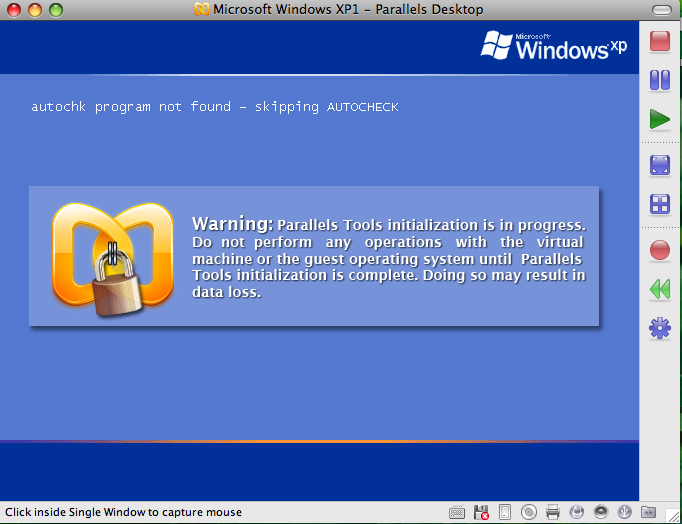 Click the “Clear” button to remove Parallels information from the boot camp partition. When asked to Activate Windows say no. Activate windows AFTER it has fully loaded. Wasn’t that quick and easy! You’ll notice that you could just as easily replace the checkbox names with div’s, radio buttons or anything that needed to have its value/property modified. This opens a world of possibilities for you doesn’t it? Before starting up new projects we make it a custom to take our lessons learned and improve. We are at that point right now and I find myself wanting something to streamline our database architecting and development process. Most of the LAMP design we’ve done in the past has only utilized a handful of tables with minimal relationships. But I’m projecting that our future work will require databases that have more normalized tables with more relationships. I just realized that through MySQL Workbench we can streamline our process. We typically go through Entity Relationship/Data Design modeling with our clients and this tool can save a few steps. We can go from those diagrams right to the database (live database forward engineering only available in the Enterprise Edition of Workbench). The folks at MySQL have blogged about the screen designs for Workbench that they are developing for Mac OS X. I’m really looking forward to it since I don’t like having to open up Parallels and use Windows for just one tool. It’s certainly worth using the Windows build in the meantime. I’m looking forward to the Alpha release coming in September. Posted in MySQL, Software Development. Usually I start these types of blogs with a decent disertation of what the problem was and then give the solution. Let’s flip that this time around since I’m in a quick blog mood. When our clients and projects started to pile up we realized very quickly that we needed to get ourselves something that can give our clients exposure to our progress and help us manage our project. In my history of consulting that was done with multiple spreadsheets and project management software. Not wanting to go down that same path I started looking for SOMETHING that could be the best of all our wants and needs. Here was the raw list of wants and needs. Wouldn’t it be great to customize it to look exactly the way you want? The solution as was previously stated is ActiveCollab. There were quite a few decent alternatives but AC really met all the requirements and then some. We have been able to customize it exactly the way we wanted and it works great. We are totally a LAMP stack shop and it was great being able to throw the code onto our sever and get it working and customized within a few short hours. Most importantly we have something that meets ALL of our needs and wants. Posted in Consulting, Linux, Management. As promised, this is the follow-up of my 21 day OfficeTime evaluation (see original post “Where did time go?“). Not that all of you were waiting with bated breath for it! Nonetheless, I’m trying to stick to my blog promises. OfficeTime certainly lived up to everything stated in the website. I was truly impressed with the integration with iCal and the ability to track not just your time but see the reports of others (I have yet to get everyone using it though, hence the blog). The benefit of the iCal integration is that when you’re trying to figure out where that time really went all you have to do is pull up your week or month and there it is. Sometimes you don’t realize how your time really gets used until you start discretely tracking it and see it visually. The other major thing for me was the Global Menu Bar Start and Stop. It’s a quick way to start timing without having to go through the run around of launching the program (the application has already found its way to my dock). In all blog honesty I hit a few recurring crashes but I was able to submit the bug and get a quick response from the team. They are also really welcoming with suggestions and enhancements that you throw their way. There are of course plenty of other talking points for this application that are really eye catching. Not that any of you look to me as the authority of all that is consulting, but this is a consultant must have App! Posted in Consulting, Time Tracker. More editing functionality and possibilities. Easier template editing (in my opinion). Completely installed and managed locally instead of publishing content to a local address through FTP. Since I wrote the post ‘Clonezilla‘ in January, our blog has been getting a lot of hits, apparently from people looking for advice on how to set up Clonezilla. This is understandable, since DRBL (of which Clonezilla is just a piece) is a complex piece of work, with loads of possibilities. So I decided to write up a small HOWTO, a quick and dirty method of getting Clonezilla up and running. Before I go on, a bit of a disclaimer: Following the instructions below may not provide you with results that fit your particular needs. If you have specific and detailed requirements, see the DRBL documentation. If you would like to hire LightCube Solutions to provide assistance in setting up a Clonezilla solution for your organization, send an email to info@lightcubesolutions.com. You’ll need a Linux machine to run your Clonezilla services. These instructions were successfully tested on Ubuntu 9.04 and 9.10 and Debian 5. DRBL will also run on Fedora. cat >> /etc/network/interfaces << "EOF"
Posted in Clonezilla, Linux, SysAdmin. The blogs are hot with chatter about upgrading to the new iphone 3G. To be honest I’m not exempt from the thought. After having used the iphone since November ’07 I’m more than pleased. (Sigh I’m already speaking past tense) It has truly been the best mobile device I’ve EVER had. But there is something about the iphone 3G that is tugging at the hem of my pants. Just brining up the conversation with my wife I get a coast to coast eye roll. So should “i” iphone 3G? Posted in iPhone, iPhone 3G. Where were you last week Tuesday? What did you do? How much time did you spend doing whatever you were doing? I’ve seen enough Law and Order episodes to know that if I’m ever asked those questions I better have an accurate answer. But have you ever really stopped to think how much time was spent working on “X” or “Y” last week Tuesday? For a small business consultant the answer to those questions directly translates into dollars and cents. There are so many different things fighting time falling into the buckets of billable and non-billable. Keeping track of everything usually becomes a memory exercise when you actually have time after the fact to sit down and write it up. I would guess that more often than not things are forgotten. Think of the phone calls, the quick emails, the text messages, and multiply that by each simultaneous project (Dare I say per client?). Besides project scope creep, not tracking time and billing accordingly can lead to a serious migraine. So where I’m going with all of this? I’ve been poking around for something other than my notebook, iCal and/or memory to track time. I’ve tried various methods over the years but haven’t been able to really get a solid solution. Personally, every minute needs to be tracked WHILE I’m doing the work. The only way to know if its truly it is the time tool of all tools is to demo it out for 21 days. I’ll let you know how it went. In response to the follow-up on the “Flock” browser, I decided this post was necessary. You see, I too felt that the browser was too busy; almost like I needed ADHD just to process the shear amount of information being delivered! (As an aside, I think I’m going to trademark the term “informatsunami™”: the farther back a browser/feed goes, the more overwhelming amounts of data get returned…with no escape!) The painful reality of my discomfort with using the browser in its intended state hit me with force of, well, a tsunami: I’m older now, I don’t need all that “stuff”! Perhaps it really is a sign of maturity, know quite matter-of-factly what I want and how I want it delivered to me. I could care less if my cell phone has a 2.0 megapixel camera with zoom, or that it plays mp3 files, or that I can download a new ringtone. I JUST WANT TO MAKE A PHONE CALL FROM SOMEWHERE OUTSIDE MY HOUSE AND NOT WORRY ABOUT FINDING A PHONE TO USE!!!! (whew, for a minute there, I lost myself…I lost myself…) Where was I…ah yes, how I want content delivered to me, I digress. I think it’s “cool” to have everything in one tidy Mozilla-based browser. But I really don’t want everything. I don’t want to be part of a social network online; it’s hard enough maintaining my relationships in person! I don’t want to share my pictures with the world (or with the select few people whom I grant access), nor do I want to view everyone else’s pictures. I don’t want to write a blog everyday, as indicated by this being my first blog post in about 5 months! I do want to check my email, the few RSS feeds I subscribe to, and some blogs/articles that center on my current professional activities; I may even want to play a game or two online. Of course, I realize that I could simply tweak/customize Flock’s settings to behave in manner more fitting my discriminating tastes. But then I realized something else: I don’t want to. I joked with “JH” about being too old for Web 2.0, about being passed by. That used to make me sad, but really, I feel liberated.